Some stains just won’t budge no matter how hard you clean them. This becomes a problem when dirt begins to harbor dangerous contaminants such as mold, mildew, or moss. If you’ve tried all sorts of bleach and detergents but the surface remains dirty, it is best to call power washing services. Kent, OH locals can avoid using harmful chemicals or wasting whole afternoons trying to understand confusing equipment. All it takes is a phone call to experts in pressure washing services in Kent, OH such as Wilhelm Power Washing. At our company, you’re sure to receive excellent pressure washing services in Kent, OH. We have been offering our pressure washing services to Kent, OH residents since 1973. In our more than four decades of experience, we have sharpened and refined our skills. As a result, several clients trust and rely on us for our top-notch pressure washing services in Kent, OH. How Does Power Washing Services in Kent, Ohio Work? During pressure washing services in Kent, OH, high-pressure streams of hot water are sprayed on surfaces such as wood, vinyl, and brick to remove dirt, oil, grime, mold, and mildew. Our crew uses state-of-the-art equipment and effective, eco-friendly chemicals when offering pressure washing services in Kent, OH. You can be sure that our pressure washing services in Kent, OH won’t harm your patio or your plants. By combining heat and our environmentally friendly cleaning solutions, our pressure washing services in Kent, OH effectively target and remove mud, mold, and mildew from outdoor patios, decks, and driveways. Additionally, our highly skilled technicians offering pressure washing services in Kent, OH can use the same solutions to remove grease stains on garage floors and the like. What Are the Benefits of Getting Power Washing Services in Kent, Ohio? Our power washing services in Kent, OH can help you preserve the beauty of your home. Our power washing services in Kent, OH effectively blast away unappealing marks and stains from your home’s exterior. Clients adore how our pressure washing services in Kent, OH help them maintain the immaculate appearance of their home, leaving their vinyl or brick exterior looking as good as new. 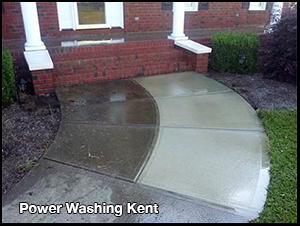 Our power washing services in Kent, Ohio help enhance curb appeal. Our pressure washing services in Kent, OH are famous for boosting the curb appeal of homes. Not only does our service enable homeowners to come home to a relaxing yard, it also helps increase a home’s real estate value. Also, exterior beauty is what draws the attention of potential buyers. Hiring a professional provider of pressure washing services in Kent, OH does wonders for the resale value of your property. Our power washing services in Kent, Ohio promote a healthier living environment for your family. Our power washing services can clean the roof of your home, targeting the damp, shaded areas where algae and bacteria breed. Wilhelm Power Washing takes pressure washing services in Kent, OH seriously. Our technicians get up on ladders and clean your roof four to six inches away from the surface. Our equipment does not merely stand on the ground shooting a stream of water wishing it would rinse the grime off. With our pressure washing services, you can preserve the beauty of your home while making it a healthy living space for your family! You only have to reach out to Wilhelm Power Washing to get started. Our pressure washing services and equipment in Kent, OH will surely make your home look better. Contact us at 330-477-7094 or 330-323-7466 to schedule a service. You can call up to 11:00 PM to request an estimate for our pressure washing services in Kent, OH. We look forward to serving you! As a property owner, you want the exteriors of your property to always look clean and presentable. However, no matter how much you try, it’s inevitable that your home or office will become filthy. With the passing of time comes an accumulation of dust and dirt, as well as the growth of mildew, mold, or moss. These contaminants will not only make your residential or commercial property look dirty but also expose you to health risks. Before you or anyone else gets hurt, you should turn to Wilhelm Power Washing. With our expert pressure washing and painting services and equipmentx, we ensure that your residential or commercial property will start looking as good as new. We are committed to your satisfaction and safety; as such, we only use top-of-the-line equipment, paint, and cleaning solutions for each of our jobs.